Officer Kowalski was born in 1954 at Boston, Massachusetts and grew up in Salem, Massachusetts. He graduated from St. Mary’s High School in Lynn, Massachusetts. He received an Associates Degree in Law Enforcement from North Shore Community College in Beverly, Massachusetts and was a member of the Danvers, Massachusetts Fish and Game Club. Prior to becoming a police officer in New Hampshire he worked for five years as a security officer for Salem Hospital in Massachusetts. In 1979, he moved with his wife, Julie, to Dover, New Hampshire and joined the Somersworth Police Department on April 22, 1979. 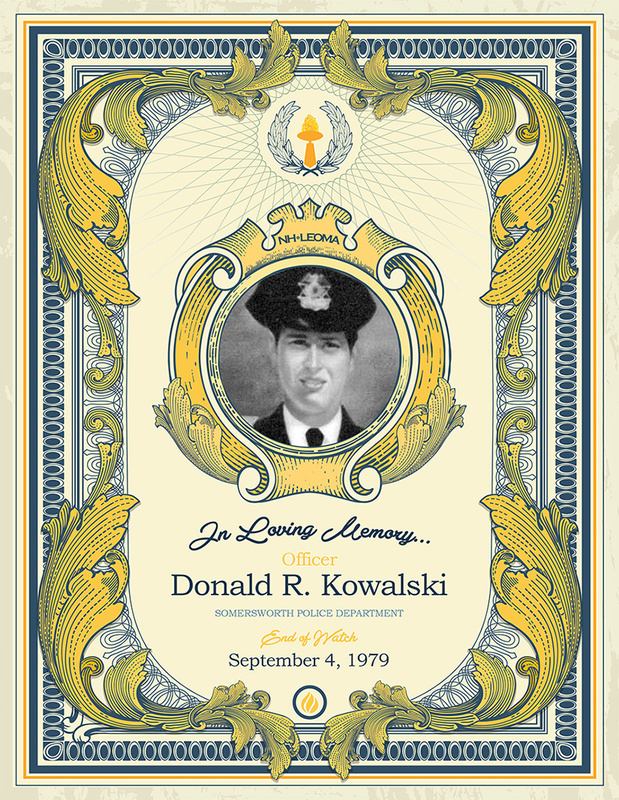 On the morning of September 4, 1979, a car stolen by a teenager struck Officer Kowalski’s cruiser on High Street as he attempted to use his cruiser as a roadblock. The cruiser was struck broadside and overturned as a result of the impact. Officer Kowalski was taken to Wentworth-Douglass hospital in Dover where he died an hour later. He was the first Somersworth Police Officer to be killed in the line of duty in the Department’s history. He was 25 years old. He was survived by his wife, Julie, and their eighteen-month-old daughter, Jennifer.